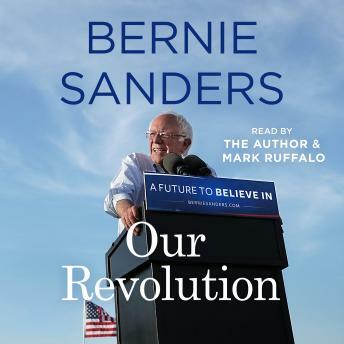 Listen to "Our Revolution: A Future to Believe In" on your iOS and Android device. This program is read by the author and Mark Ruffalo, an award-winning actor, director, producer, and social activist. When Bernie Sanders began his race for the presidency, it was considered by the political establishment and the media to be a "fringe" campaign, something not to be taken seriously. After all, he was just an independent senator from a small state with little name recognition. His campaign had no money, no political organization, and it was taking on the entire Democratic Party establishment. By the time Sanders's campaign came to a close, however, it was clear that the pundits had gotten it wrong. Bernie had run one of the most consequential campaigns in the modern history of the country. He had received more than 13 million votes in primaries and caucuses throughout the country, won twenty-two states, and more than 1.4 million people had attended his public meetings. Most important, he showed that the American people were prepared to take on the greed and irresponsibility of corporate America and the 1 percent. In Our Revolution, Sanders shares his personal experiences from the campaign trail, recounting the details of his historic primary fight and the people who made it possible. And for the millions looking to continue the political revolution, he outlines a progressive economic, environmental, racial, and social justice agenda that will create jobs, raise wages, protect the environment, and provide health care for all-and ultimately transform our country and our world for the better. For him, the political revolution has just started. The campaign may be over, but the struggle goes on. Very informative. Loved this book. Good book. Will vote for you 2020. Thank you for your candidacy. I will always strive for your vision to create a more just world so that we may all have \'A Future to Believe In\'! A must read for all people seeking hope for the future of America. Bernie is a hero!! Such a great book and true example of the change that needs to take place. Amazing, we need a Bernie revolution! I love this book.